It’s definitely feeling like autumn now. The air is crisp early in the morning and late in the evening and the weather is hot during the day but dry. It’s the perfect weather for hiking and drying food. Last weekend when hiking I saw many different types of foods left drying in the sun. As you know Cantonese use a lot of dried produce in their cuisine: fruits, vegetables, plants, seaweeds, fish, nuts, pulses, etc. and of course fish and seafood. The common method for drying food here doesn’t require any dehydration equipment. It is not surprising to see food drying in the sun on the crowded pavements of busy districts, for example in Sheung Wan which is famous for its numerous shops selling dried seafood products. Here is the list of the food I saw on the way from Tung Chung to Tai O. As you will see the food is simply laid out to dry in the sun. Edible seaweed/grass called sahp-baat-tàuh (十八頭 - lit. eighteen-head) or gaâu-choi (膠菜 - lit. rubber-vegetable) / displayed on flat bamboo trays. I don’t know the exact English name. The dark grass (1st photo) is let to dry then washed and put to dry again, etc. until the grass is as white as possible (2nd photo). I don’t think I have ever tried it (unless it comes with another name) but my guess is that this grass might have a rubbery texture. Tangerine Peels 陳皮 (chàhn-pèih - lit. aged-peel) [Used as a seasoning in many dishes: stews or soups] and Peanuts / spread on ground (with or without a cotton fabric/ sheet). 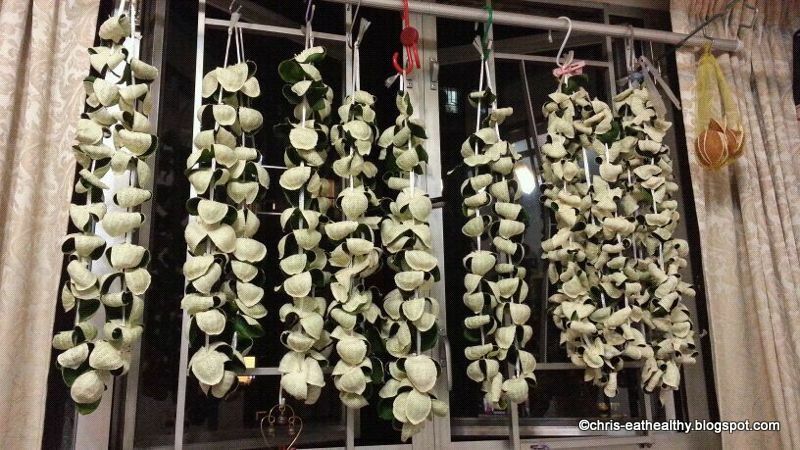 My friend Phoebe’s parents make their own 陳皮 by hanging out fresh tangerine peels on their flat’s window guards. Fresh bok choy (白菜 baahk-choi in Cantonese) / Hung over bamboo poles. The person who is drying bok choy here has built his/her own drying device with 2 bamboo poles resting on parallel guard rails. 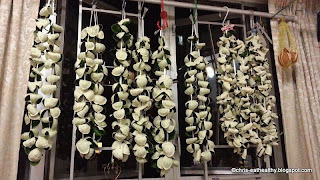 Once dried the vegetable is called choi-gôn in Cantonese (菜幹- lit. vegetable-dry). Before being able to enjoy the above in their dried form whether in stews, soups, steamed or teas I like watching the food being exposed in the sun and observing the changes in colour and shape. This is pretty neat! I should try drying tangerine peels myself - love to snack on them. Never tasted uncooked peels..will try!